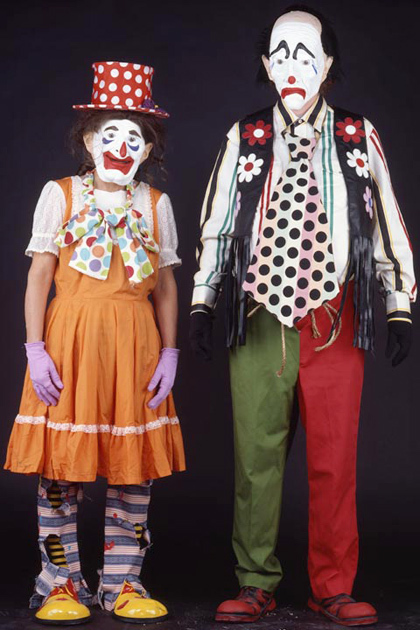 Clown parents are disappointed in their non-clown adolescent. We knew the clown was different by his business card, which advertised “Sensible Entertainment for the Betterment of Children.” There was a picture of a man in a gray business suit, tie and slacks with a serious face. Because we were sensible adults and cared for nothing more than the betterment of our children, we called Samuel, the sensible clown. “Which friend?” the voice piqued for some reason. “Jerry…or was it Nancy…,” we had to jog our memories. We weren’t expecting this so soon in the conversation. “Jerry! No! Nancy!” we screamed, feeling really on the spot. So we did. And then we remembered. It was Nancy whom we saw in the grocery line, buying bottles of cough syrup the color of early morning vomit. Nancy had told us about Samuel and his methods – both pedagogical and down-right fun. Samuel showed up to our house dressed in the gray suit, tie, and slacks, exactly like the picture on his business card. We invited Samuel into our home and asked him if he was thirsty or hungry or if he wanted to see his clients, the children, who were, at that moment, in the backyard, running around in circles with pots on their heads. “Well, it’s not like they’re chickens,” we said a bit too defensively. Samuel looked at each of us in turn and then posed his leather briefcase on our dining room table, clicking the latches, causing it to fly open with a sudden, ecstatic release. Inside were sober folders, a stack of legal documents, and a bright, fluffy clown’s nose. Samuel took the folder, tapped it on the top with his index like a cigarette, straightening its contents, opening it widely on the table. The document read: Samuel the Clown’s Safety Waiver and, when we scanned it with our glasses perched on nostrils, we realized it was the size of a short Tolstoy novel. “This is a bit intimidating!” we intoned. “It’s common protocol,” Samuel informed. “For any serious clown,” he said, affixing the bright, red bulb on his nose. “Can you maybe give us a brief summary?” we asked a bit worried about the children who had become strangely silent in the intervening minutes of Samuel’s arrival. Samuel sighed and turned the heavy stack of documents to the last page that read: Brief Summary: Samuel is not responsible for any psychological damage that was present in children before his arrival. Samuel is not responsible for sudden, uncharacteristic behavioral changes in the children, including hard-workmanship, studiousness, or sudden interest in The Times. If betterment is not observed within the first fiscal week following Samuel’s pedagogical visit, money will be fully reimbursed after a cursory study of children’s before and after behavior. “We already have,” Samuel said, squirting us with his lapel flower. The children were seated, equidistantly, in neat little lines, facing Samuel, who was standing in front of a pliable blackboard, on which was stenciled a happy, little dog. Samuel was wielding a long, narrow pointer, which jutted from his palm like a sixth finger. He pointed to the picture of the dog. The children dug at their noses and stared. A child fell over on its side; another began to eat the contents of its nose. A child dared to raise its hand. “You may speak,” Samuel said like a command. “Why does Sensi only have one eye?” the child asked timidly. Samuel looked at his drawing, pinching at his chin with index and thumb. The children removed their fingers and swallowed deeply. Three weeks later the children began wearing suits to the breakfast table and carrying small, leather briefcases filled with crayons and portfolios. We had to be scheduled for visits in their Barbie Agendas months in advance. They started taking classes on career development and practicing calisthenics, using the playground slide for support. They were learning Chinese by correspondence. “Why don’t you go play with the other children?” we asked. We woke one day to find the children had hired interns to cook their meals, to schedule their meetings, and to give them their baths. “But what is left for us?” we asked one intern, Joey, a chipper twenty-something NYU grad. “Just relax,” Joey said, shuffling through papers filled with sober figures. “Think of it as a vacation,” he said, creases running down his sweaty forehead. “Some of us would kill for a vacation,” he said chipperly. Samuel, the sensible clown, answered his phone after only one ring. “Speak,” Samuel said like the voice of God. We tried to speak reasonably with the children. They snapped their fingers at the interns and pointed at us. Joey pushed us out of the children’s room like a stalled vehicle. “You should be proud of the children,” he said before closing the door behind us, silencing the steady appeals of the Bloomberg Radio Station. Carl was standing on our stoop, smoking a non-filtered cigarette, scratching a bald spot in the middle of his clown afro. He was screaming something about horses and bets into his Bluetooth, which stuck out from his ear like a bloated tick. When we offered him our hand he looked down suspiciously and then continued to talk to his friend, who we assumed was his bookie. Carl flipped his phone shut, asking if he could enter now or if maybe we’d rather he waited outside all day in the rain. It was true; it was raining. We should be more observant about these types of things. Carl trailed in dirt when he entered the house, leaving caked footprints. The children used mats under their bottoms in order to avoid soiling their Italian trousers. They were busy, plugging away at their iPhones when Carl swaggered up on stage. Carl took a long sip from one of the bottles. A worm bobbed up and down at its base like an attractive bait. “Now watch this,” Carl said, setting the bottles’ tips on fire. We didn’t expect such dramatic changes from the children. They traded in their miniature business slacks for wide, multicolored parachute pants. They grew out their hair to their tiny shoulders, holding it back with bands. But the worst was the marijuana smoking. “You’re going to damage your little brains!” we cried. “Can’t you wait until college? “Hey, we’re not conformists,” we corrected but refused to go into details. The children lay out in the sun for hours, damaging their developing skins. “You don’t happen to need assistance?” Joey asked, handing us his thick resume. We were really at a loss. Who could possibly teach the children correct behavior now that the clowns had failed? The answer came unannounced at our door one Sunday afternoon. “Are you seeking help and guidance?” the muscled priest asked. “Oh, God yes!” we affirmed. “The Lord works in mysterious ways,” the priest said, applying ascetic clown makeup to his face. We weren’t able to see the children’s expressions, which were concealed in thick clouds of smoke. We knew the children were amused by their furtive giggles but were unsure if it was the priest’s comments or the drugs that elicited the response. “The Bible,” the priest held up the thick book, showing the children exactly what he meant, “is filled with important moral lessons. It is also filled with harsh truths that man has forgotten because of his daily distractions.” The priest flipped open the Bible, pointing his fingers in its folds. The priest cleared his throat with his other hand, which was curled in a tight fist. “When the Lamb opened the fourth seal, I heard the voice of the fourth living creature say ‘Come!’” the priest yelled, his neck vibrating with blood and thick veins. “I looked,” the priest said, placing his hand over his eyes and looking beyond the children, towards the sand box, “and there before me was a pale horse!” the priest screamed as a large globule of spit left his mouth. “Its rider was named Death,” the priest whispered, “and Hades was following close behind him.” The children began to visibly shake, causing their marijuana cigarettes to drop from their mouths. “They were given power over a fourth of the earth to kill by sword, famine and plague, and by the wild beasts of the earth.” The priest closed the book and looked at the children. “This is the Truth,” the priest said as the tears ruined his clown makeup. We didn’t mind the early Sunday morning wake-ups calls, nor the addition of Church services, but the flagellations were where we drew the line, honestly. What will the neighbors think, seeing the children bloodied and prostrate on the front lawn? Unwholesome thoughts were nothing to get so worked up over, were they? The children looked up at us with their wide, swollen eyes. “We’d rather not go into details,” they said, removing the shirts from their backs to begin the next round of purging. It was then that we decided to take some drastic measures and called Grandpa Chuck. We had some reservations about his parenting from experience. We explained the many methods we had taken to offer guidance and education to the children, hiring not one, but three different clowns. “Have you tried talking to them?” Grandpa Chuck asked. “Have you tried that?” he asked a bit too aggressively. The children nodded, scribbling in their notebooks with crayons. “Alcohol and drugs,” we told the children, “should be consumed. When you’re old enough. Which is roughly at seventeen,” we added to their disappointment. “Moderation is the key like most things in life,” we said like real hypocrites. “Don’t let others take away your individualities,” we said seriously. “This is probably the most important thing we can tell you,” we said, hugging each of the children. “It seems pretty out there,” we whispered later in bed. “Do you think it will work?” We glanced at each other and thought about our parents and the traumas. We could hear the children in the other room, snoring and focused on that which is most important: an undisturbed sleep. Jovan Popov-Albertson is a writer and translator from Western Iowa. He is doing his MFA in literary translation at the University of Iowa. His poetry or fiction has appeared or is forthcoming in Paris Lit Up, Brushfire, and Yellow Chair Review. He lives in an attic and probably always will.